The Polo Bar popover is restrained and tailored like a Ralph Lauren pin-stripe suit. 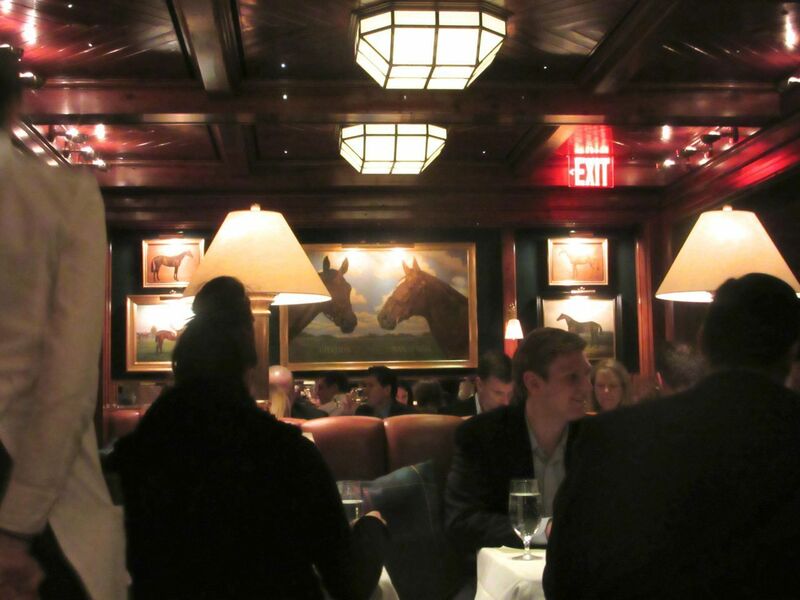 “I guess I’m not getting into The Polo Bar any time soon,” my friend Bob lamented. It’s not like he’s a kid and needs to believe in Santa Claus. He can handle the truth. “You’re probably not, Bob.” I agree. At the Polo the mise en scene counts as much as the mise en place. No need to check your polo cap. Ralph was not wearing his bespoke English tweeds last Thursday night when he made the rounds of what must be the VIP area at his new, sizzling hot Polo Bar. The dining room is below the bar, a very narrow bar. 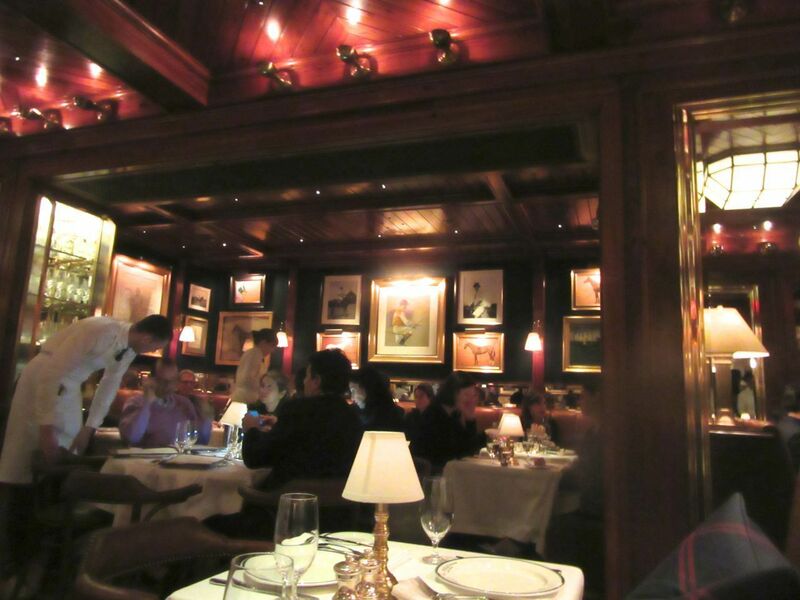 If you’re not a Ralph Lauren person you probably aren’t going to get in just by looking good and hanging out in the bar, trying to make an impression by sipping 23-year-old Speyside single malt scotch for $86 a guzzle. Early responders include the pretty young things and tag teams of one percenters. What to wear? 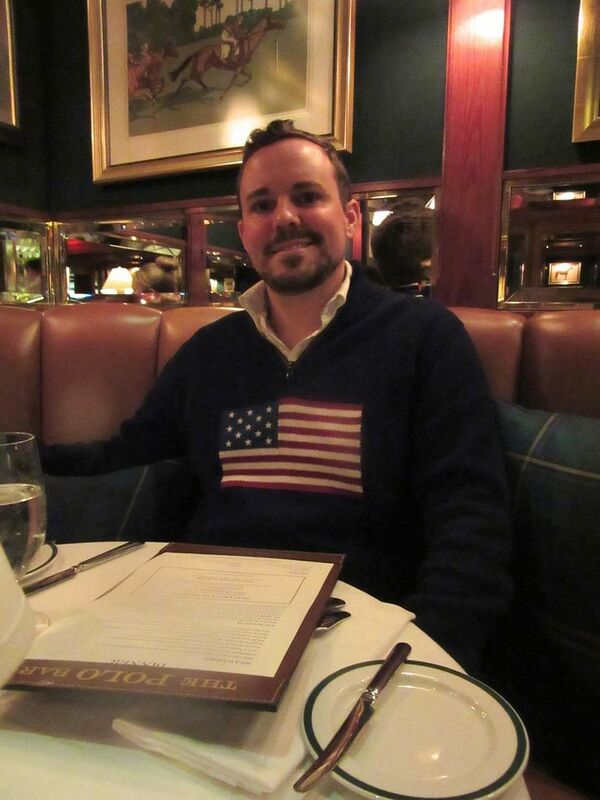 Ralph iconic American flag sweater is perfect, rates a quiet corner in the VIP room. From our table in what must be the press section – we’re seated next to a duo of pretty young things from Condé Nast -- we are mesmerized by the action. I’ve never seen Ralph Lauren in person before. I only know the attractive young guy in denims and leather in the ads. Somehow, he’s become a small elderly man (okay, okay, probably younger than me) in a dark-checked wool lumberman’s shirt hanging out over his jeans and fancy sneakers bigger than his head. He greets Police Commissioner Bill Bratton and his wife Rikki (the court expert you see on TV) and chats up Regis Philbin and their friends at the priority six-top, then settles at his own secluded table. I doubt anyone would giggle if you show up in jodhpurs. And why shouldn’t Ralph be casual? It’s his rec room after all. 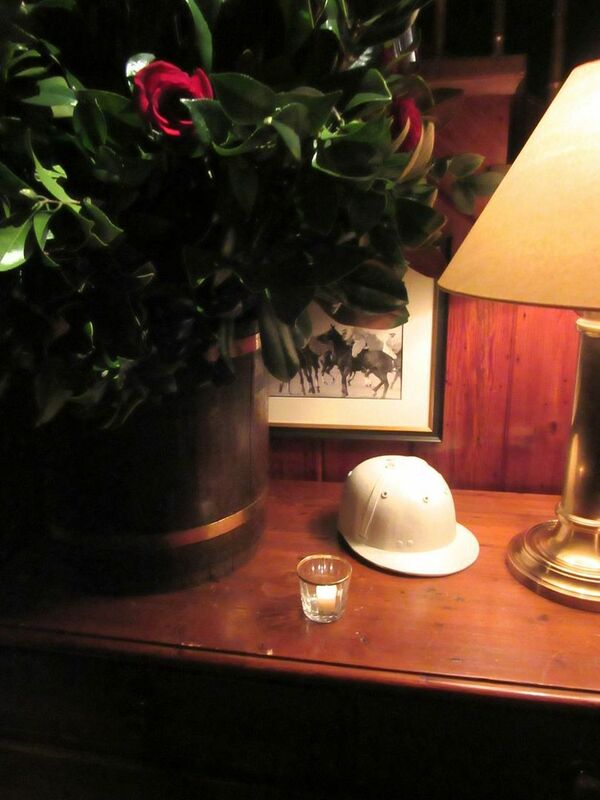 We’re here at his club where patrician ancestors and their horses cover the walls, polo mallets hang in the hall, everyone is blond, and there’s a white polo helmet on the hall table next to an explosion of red roses. Let the one percenters wear the suits. The rest of us can preen and ogle and pretend we all ride on weekends and compete in dressage (if not dressing), bathed in a soft glow from brass lamps focused on gleaming wood ceilings. The waiters of course, wear Ralph Lauren wingtips. 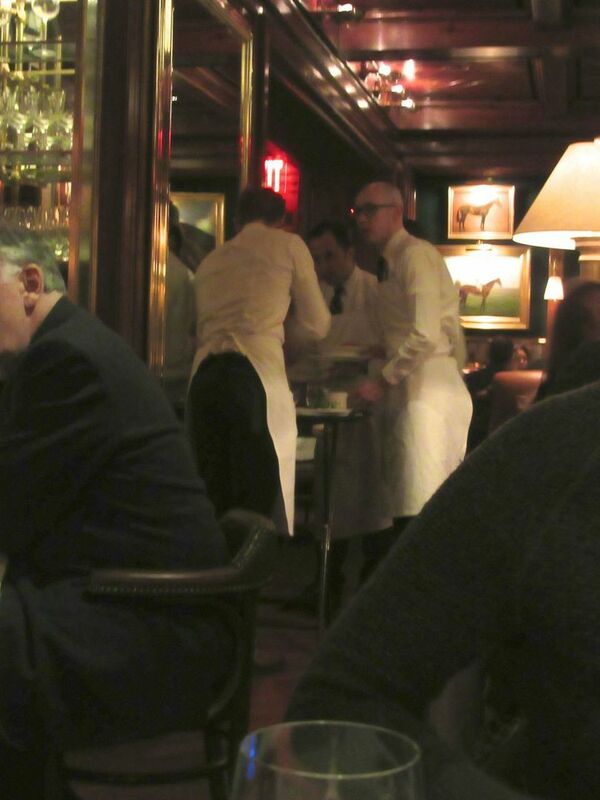 The waiters are wrapped in white aprons and wear shiny luggage wingtip shoes. If we were daintier, we might actually need the big fat tartan plaid pillow waiting on the banquette. Is that the Lauren clan plaid? I wonder what shall I call her? Servant? The help? A retainer whisks the redundant pouf away. Friends who reported arrogance on the telephone seem shocked by the friendliness of the staff: they are everywhere, in a ratio of one of you to one of them, welcoming, wishing you well, hoping you had a good evening. Tables are not only swathed in cloth, they’re padded underneath to absorb sound. Very professional. I assume you’ve been in Ralph’s Madison Avenue manor house if only to buy a tie and say you were there. You know the look. 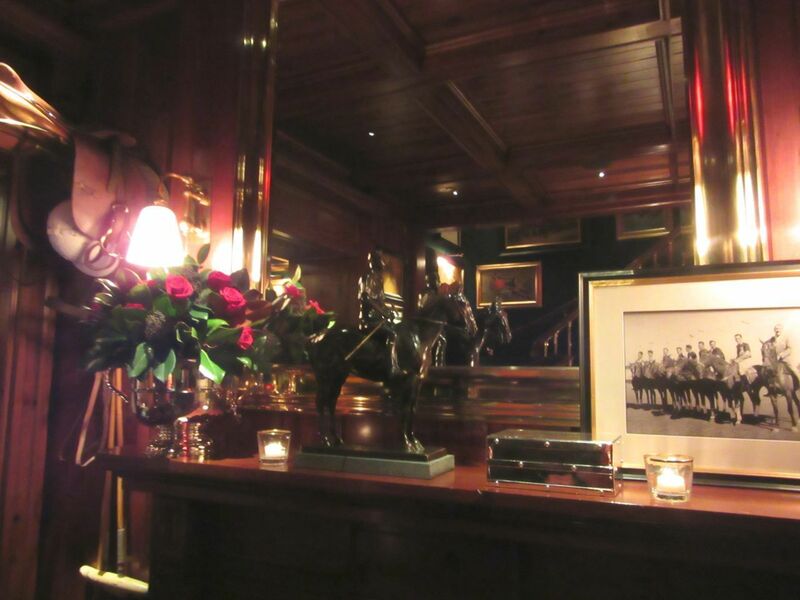 Many photographs of horses line the Lauren deep-green walls of the ladies room. It is certainly no accident that the photo over one commode eyeing your perch is a female sitting on the fence. I can imagine Ralph himself searching the stock for a suitable image. The attendant waits discreetly in the hall. There is no dish for tips. “They must have recognized you as a VIP and sent corned beef canapés,” the press agent tells me. Enough, you say. What about the food? you want to know. Well, it’s okay. Occasionally even, quite good. It comes with the house logo on every plate and old-fashioned Colonial style silver that you might have inherited from your great-grandmother if she’d fled the Cossacks with more than a small cardboard suitcase. 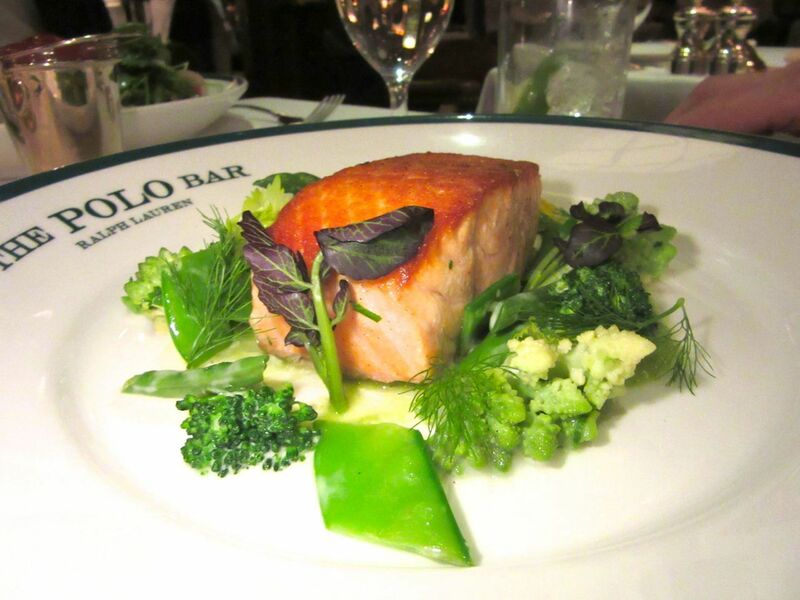 The wild salmon is carefully cooked and prettily plated but lacking in flavor. It’s everything Ralph likes to eat, and that means it’s what people like to eat. The roasted butternut squash soup was thin and too sweet on an early visit, and the perfectly rare, handsomely presented wild salmon had no flavor at all. But at my last tasting, the kitchen seems to be finding itself. 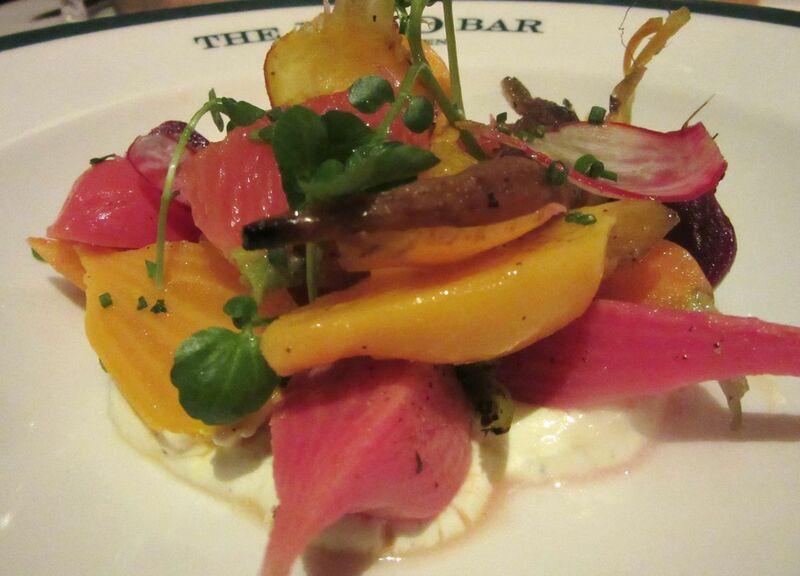 Citrus gives spark and vibrance to raw root vegetables on a ricotta turf. Order a refreshing Moscow Mule or the Prohibition Spice from the cocktail list ($16 to $21), maybe two, and relax. Isn’t that Al Roker and Deborah Roberts moving through the room like the Manhattan royalty they are? Of course, you caught Kelly Ripa greeting her dentist. And you may not recognize author and wine columnist Jay McInerney in the far corner, but I do. 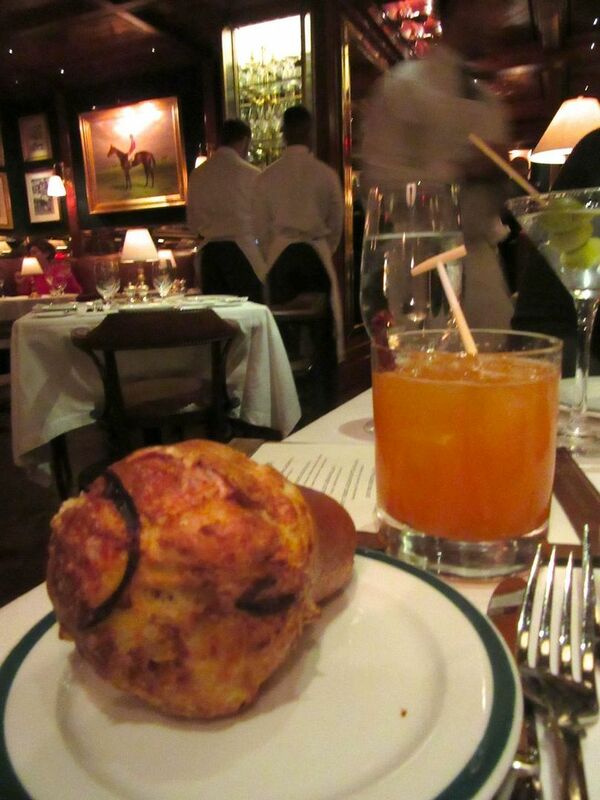 Consultant Laurent Tourondel of BLT Steak and Arlington Club put his sous chef Sepp Stoner in charge, so a discreetly trimmed-down version of a Tourondel popover with onions and emmentaler, properly warm, arrives promptly, with very good butter. And for VIPS like me, I’m told, there might be neat cuts of Ralph’s favorite corned beef sandwich, oozing melted Swiss on a wooden platter. 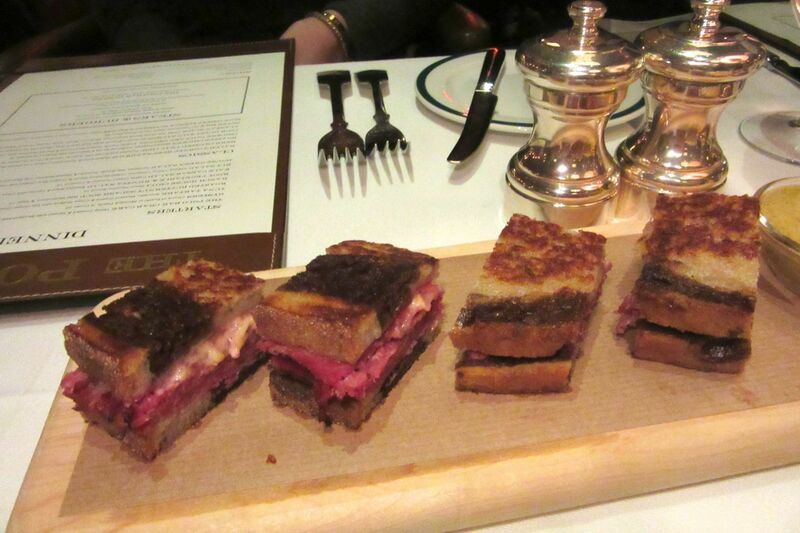 If you don’t get a corned beef amuse, order the sandwich – two big wedges on toasted bread to share. If you don’t see any sign of delicatessen amuses, don’t commit suicide. 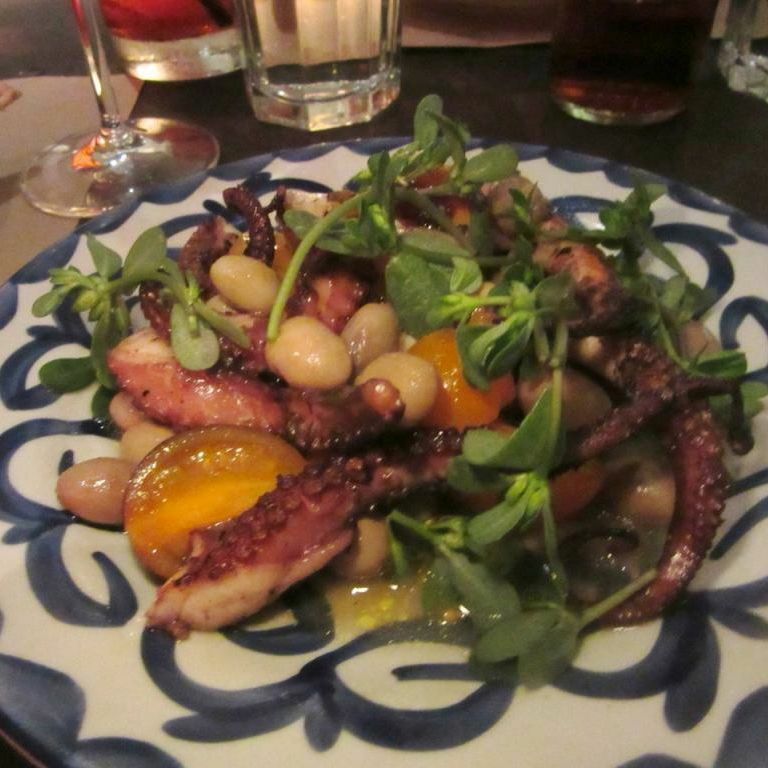 Pretend not to take it personally and order it as your entrée. 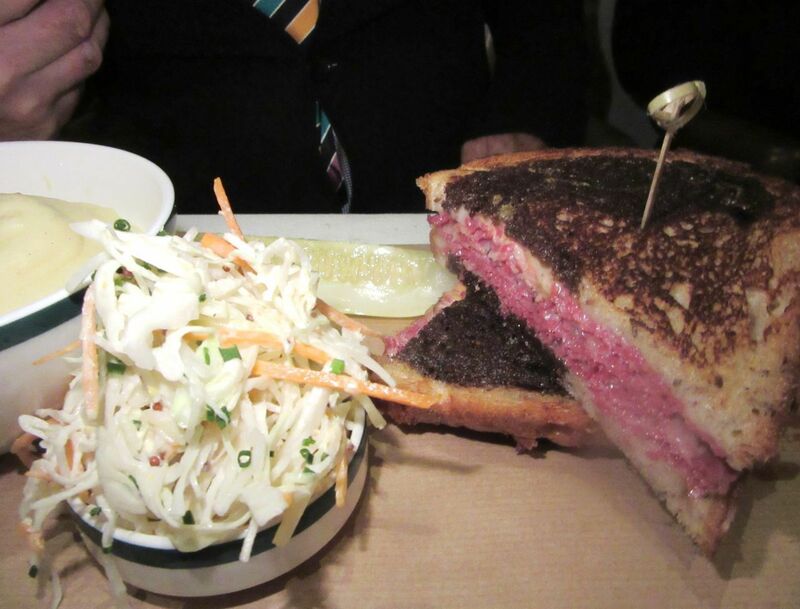 It comes on toasted rye and pumpernickel-marbled bread with a big, fat, fully dilled pickle alongside a ramekin of coleslaw (horseradish it says, but you can be sure the heat won’t jolt you out of your boots. Western, I hope). 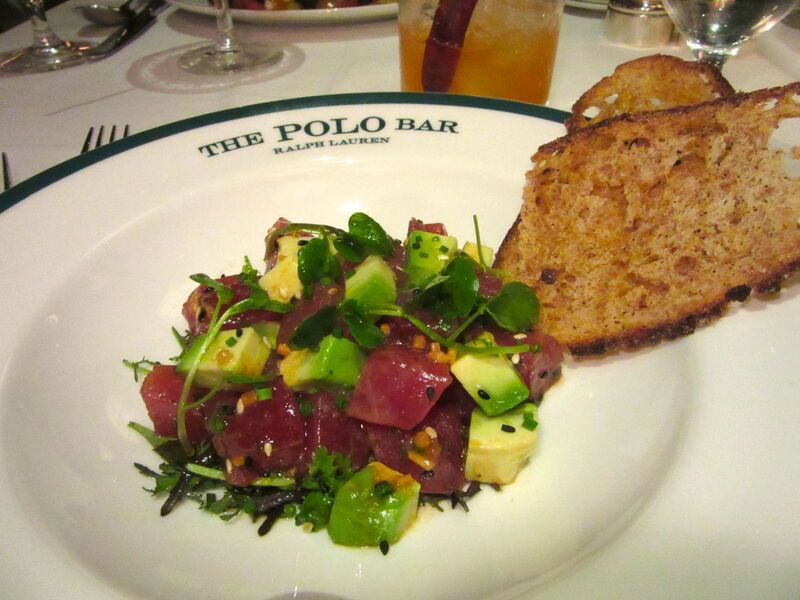 It’s not just another tuna tartare paired with avocado. Ginger adds an extra dimension. The tuna tartare, usually a safe starter around town, is better than safe here: sprightly chunks of tuna are tossed with impeccably ripe avocado in a soy ginger dressing. 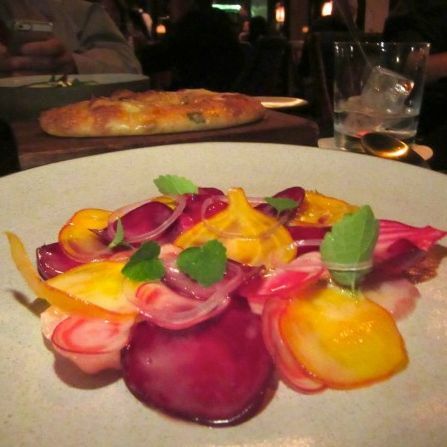 Root vegetables with a citric tang nestling in a swath of ricotta are fresh and lively, too. 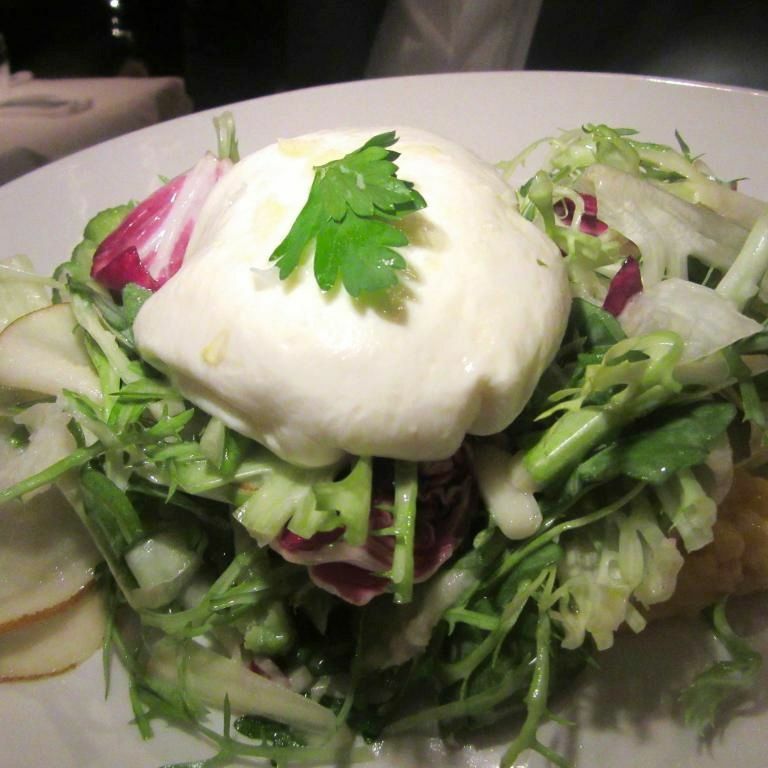 Another day, another wedge salad. The iceberg is so crisp you may need a steak knife to cut it. Don’t feel you have to apologize for loving an old-fashioned wedge salad now that you’re grown up, because Ralph loves it too. 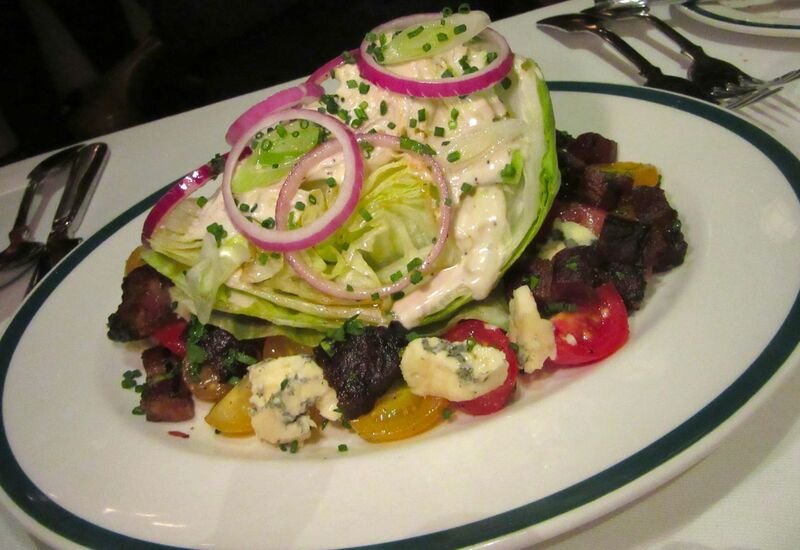 His BLT salad doesn’t sprawl decadently as some do, but is a tailored iceberg wedge surrounded with cherry tomato halves and Berkshire bacon chunks discreetly smothered with Oregon blue cheese dressing. 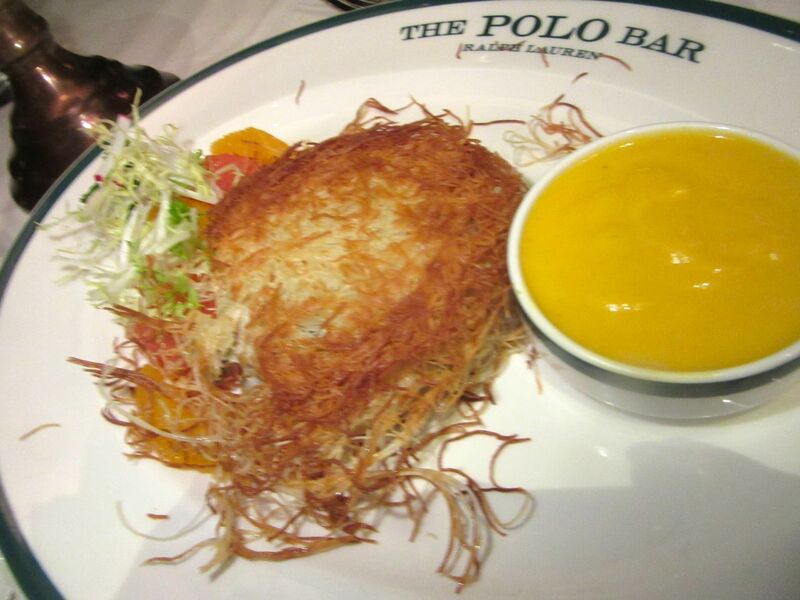 And the crispy filo pastry threads that crust the crab cake will distract your memories of supernal crab cakes you had at the Sea Grill. 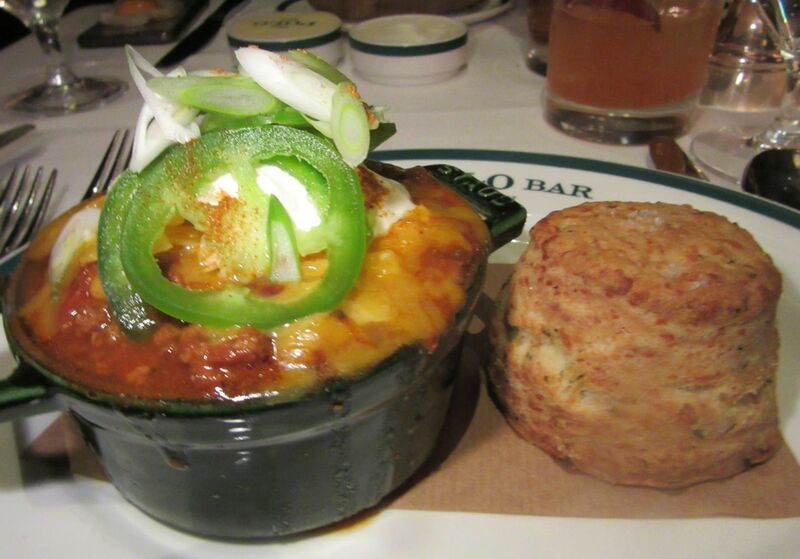 Even if the chili wasn’t better than average, the biscuit alongside makes it essential for me. My favorite starter is Ralph’s Ranch House chili. I don’t mind that it’s a pale shade of great because it’s topped with sour cream and jalapeno thins and comes with a fabulous pecorino biscuit. Anything with a biscuit does it for me. I plan to order the chili as an entrée next time, hoping someone will get the corned beef and we can share. I will be in heaven even though I wasn’t to the manor born. Or is that to the manner born? The chicken is not too cooked, not too proud to nest alongside mashed potatoes. 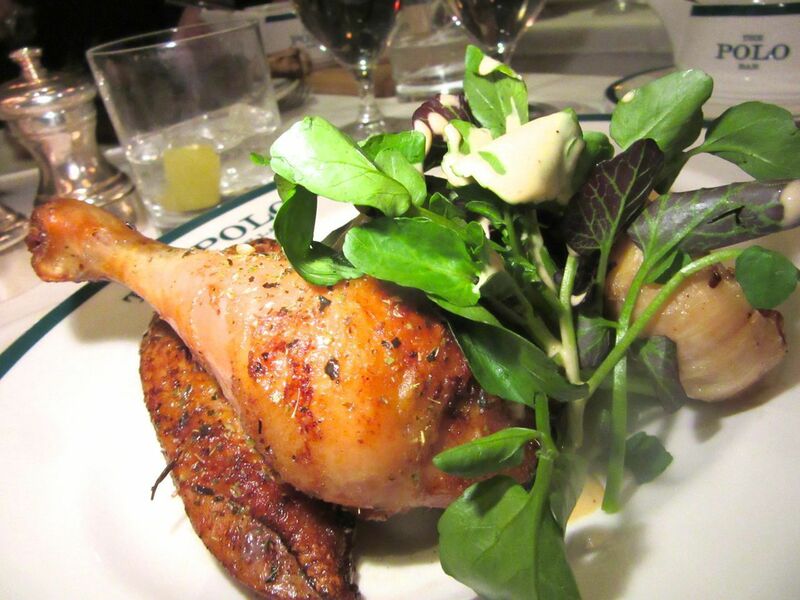 Not to suggest that the chicken isn’t a fine choice. It’s been juicy and not overcooked on two occasions. One of my companions was disappointed when the veal chop turned out to be pounded Milanese style, topped with the usual salad, but that just might be your favorite thing. I can’t promise anything with the rib eye. Each time it was different. Cows are like that. 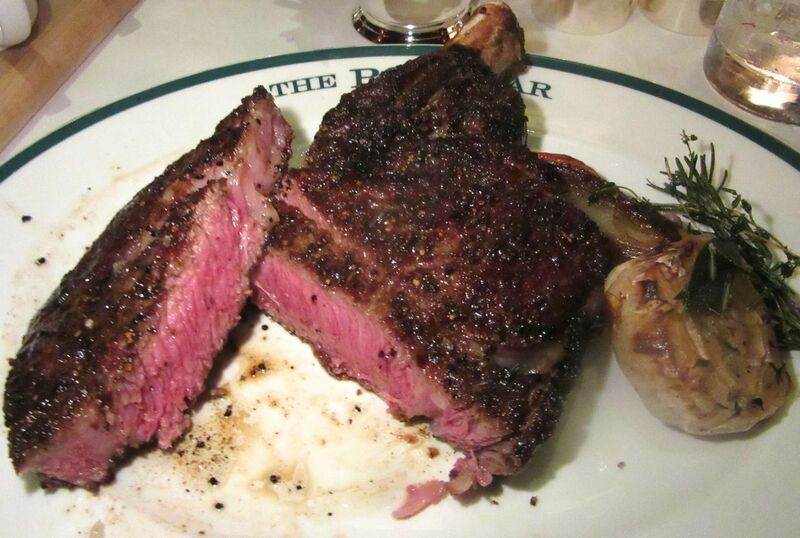 My friend, the steak expert, found the $55 22 oz. bone-in rib eye “over aged” and “definitely not prime.” I agreed it was unusually tender, without the meatiness of a great steak and too salty, but I found it beautifully caramelized, deliciously charred and perfect for two to share. We hadn’t ordered a choice of sauce, but our excellent waiter Mohammed brought all three – peppercorn, spicy garlic with parsley, and horseradish cream. It takes two tries to get extra crispy fries but this silver horse bucket holding catsup makes up for that. By the way, I’d asked for the fries that came with to be “extra crispy.” And they were when they returned after we sent them back for crisping. Just two nights later, the rib eye is less tender, less salty, not quite as flavorful. So maybe it is about aging. Or the cow. 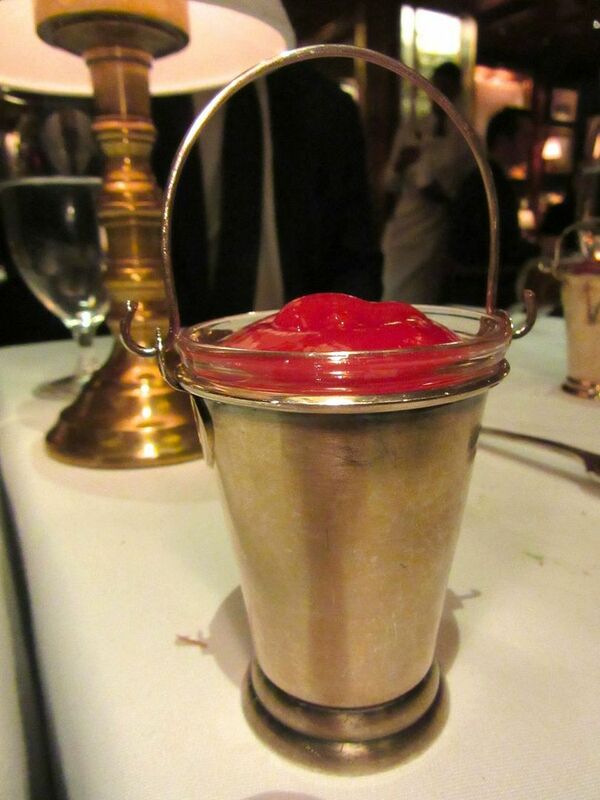 The waiter hears me longing out loud for béarnaise sauce – not on the menu -- and offers to ask the kitchen. The béarnaise arrives promptly with the fries – crusty on first try. 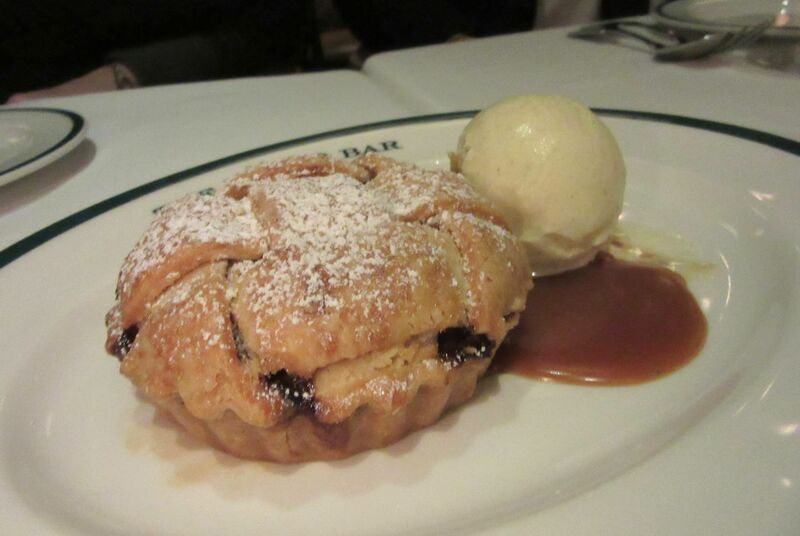 The waiter brought apple pie by mistake so we ate it. Ralph’s desserts are all vintage hometown American too, and only $10 or $12. I suspect Mohammed brought the lattice-topped apple pie though I ordered pecan because I pronounced it pea-khan instead of pea-can and he misunderstood. We ate them both – the pecan is very sweet, but that’s the way it is. As usual the no-room-for-dessert team polished off the very good Polo Bar Brownie studded with walnuts and topped with vanilla ice cream and a long pour of warm chocolate sauce. I turn my head and the luscious old-fashioned chocolate cake is virtually demolished before I can get my fork in. Don’t let that happen to you. 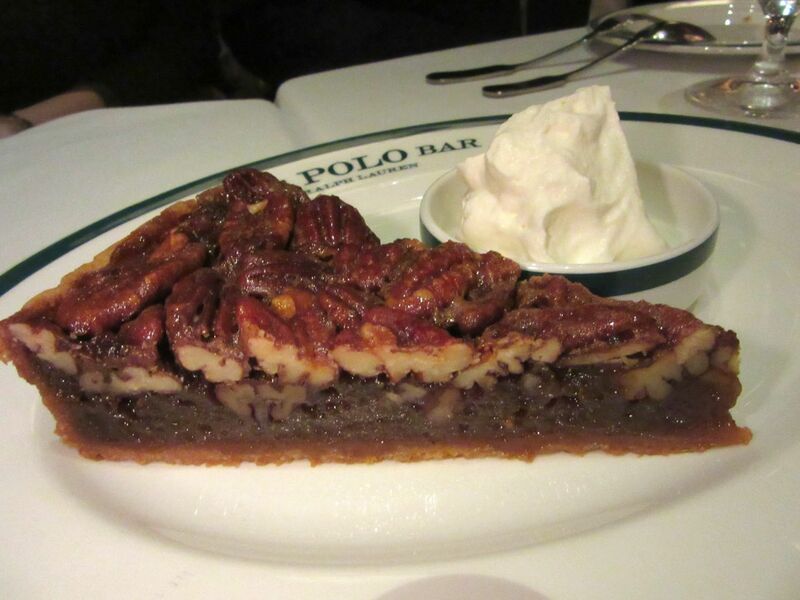 Charleston Bourbon pecan pie is meant to be sweet so I’ll stop complaining. Am I the last to know that Ralph has his own coffee? I don’t drink coffee after 4 p.m. for fear of not being able to control my dreams. Last week I dreamed Philip Roth was asking around for my phone number. Ralph’s coffee ice cream is not remarkable, not very creamy like Howard Johnson’s used to be, made with espresso. Feeling nostalgic? Click here to read my August 3, 1970 roundup: “Everything You Always Wanted to Know About Ice Cream, But Were Too Fat to Ask.” Or skip it, so you can slither into last decade’s Ralph Lauren frock. 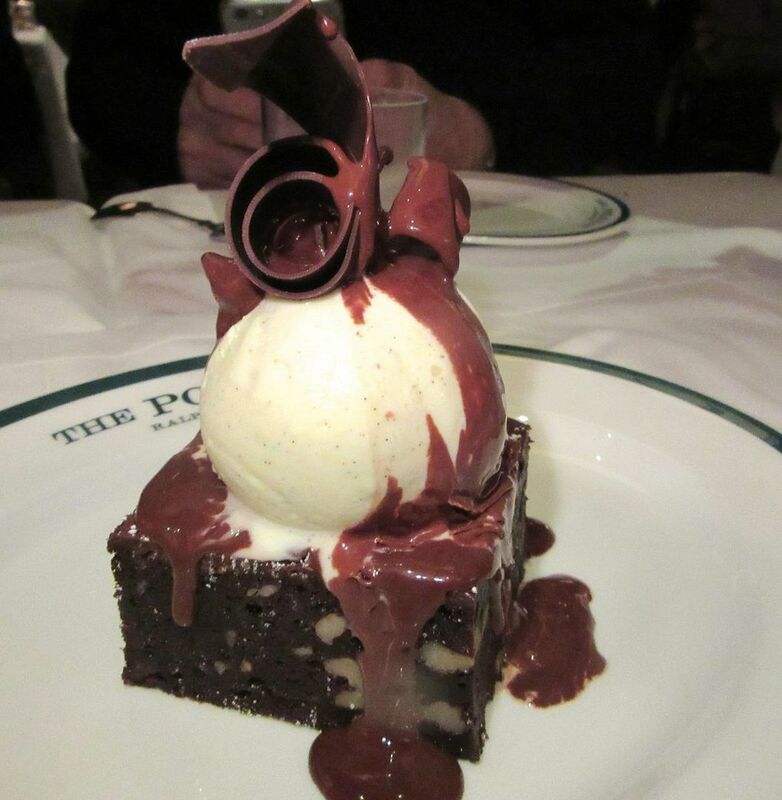 The walnut-studded Polo Bar brownie is topped with ice cream. A waiter pours on warm chocolate. At Downton Abbey you have to marry to get into the manor. Here you just have to score a reservation. Perhaps you should try for Saturday night, when the rich, the celebrated and the otherwise entitled are tucked away in their Connecticut hideaways and snow-covered Hamptons. 1 East 55th Street between Fifth and Madison Avenues. Seven days, 5 to 10 pm.